Last week was very hectic week. Not only that we went for The Grand Opening of SPROUTS at The School....my kindergarten also had various activities...there was Report Card Day, Class Party Day and our Concert & Graduation Day. Mamarazzi was lazy this year. Decided to fry nuggets only la. No need make muffin, jelly and whatever coz from previous years experience ..no very "laku". Most kids will like nugget. When I came home, I told Mamarazzi that my class teacher "belanja"(treats) us KFC. 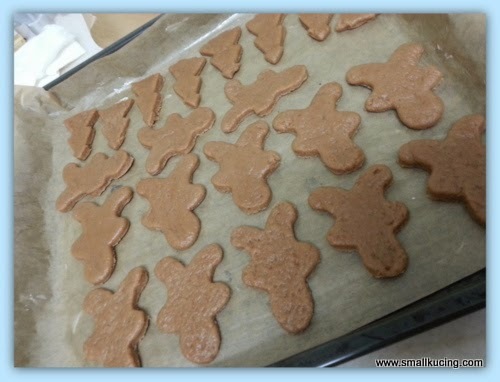 The evening before class party, Mamarazzi decided to make some Gingerbread man cookies. I also wanna "help" make la. Ah Mah was there and she wanna learn too. I told her about my Class party and that Saturday is my Graduation Day. Invited her and Ah Kong to my Graduation which is to be held Saturday morning. She told me to snap more photos for her to see la coz she won't be attending as they have been away from home for a week already. She "rindu"(misses) her home and anxious to get home quickly. Worried about her 8pm flight on Saturday night. Oh well...Nevermind la. It's only Kindergarten Graduation. Not University graduation. Can always come for my next graduation la. Mamarazzi said Mamarazzi may not live that long to see my next graduation leh. Why? Coz she said I made her "vomit blood" wor. Asked me to "chop" the cookies properly, I went and shake here and there. Ahem....can you see from the above pic...which one "chop" by me and which one "chop" by Mamarazzi? On the morning of my Graduation Day, we dropped Ah Mah and Ah Kong at a relative house. They go "partying" la while we head over to the Concert & Graduation Venue. Had breakfast. The "buffet" breakfast they provided this year was very good. Got Curry Puff, Sponge Cakes, Donuts and Soya Bean drink. One of my "Cikgu" did the "make-up" for me. Had to put "ICI" very thick or else will look pale on stage. Waiting for our class turn to perform on stage. Mamarazzi said this year concert was very good. No idiots anxious parents went in front of the stage and snap photos of their kids with their camera, phones, iPads or tablets. Two years ago, our concert video ended up looking like pirated video from pasar malam due people crowding the stage. Got a small trophy this year for Best Improvement. Yup....Mamarazzi said under this teacher, can see my Mandarin had improved much. Nope...can't see through.....not a magnifying glass. Our year we had two performance. First was the dancing and second one is Drama. Our Drama was "My ambition" . Can you guess what is our ambition here? Yay...Finally got my "scroll".....errr.....where is the square hat ah? After getting the "scroll" , time for a group photo pulak.....LOL....thorn among the roses. Last performance by the Graduates. A Chinese Poem and Auld Lang Syne Song. One thing Mamarazzi likes about this Kindergarten is that the Concert is not solely about the kids but also about the parents and teachers. Also...each teachers and even helpers of the Kindergarten was also presented a gift by the Graduates. She is the one who saw me "naked" when I "opsie" in the kindie leh. Fast fast snap coz everyone were going home. Muhahaha......"Harry Potter" graduate from "Hogwarts"...eh...mana my specs ah......forgot to wear. My teachers from "Hogwarts". All very "sporting". This is my Class Teacher "Mdm McGonagall". She is someone who is not to be crossed, a rigorous disciplinarian (she is the Deputy Principal) but also have a kind heart. She really worries about my survival in primary school as am a bit blur sotong like Mamarazzi . This is one of my partners in crime. The three of us always makes "Mdm McGonagall" vomit blood. Always fighting and making noise. oh ya.....before ending.....here is the Points To Ponder by the my Kindergarten Principal . Can't tell the difference. The gingerbread men all look the same, all nice. So nice of you to help to make them. Congrats on your graduation. You're growing big and handsome now... Be a good boy, study hard in primary school, ya! All the best in the years ahead. Can't tell the difference ah...wah...yay! means am as good as Mamarazzi! Fuiyoh, mamarazzi so terror, know how to make Gingerbreadman cookies.. I still remember mamarazzi made the glass-stained colourful cookies, very nice.. I thought mamarazzi will make that again timm.. Oohh yeah, fry nuggets better.. Sausages, fishballs and nuggets cannot go wrong.. Fried rice, mihun and sandwiches also cannot go wrong.. if kids don't eat, teachers can tapao back too ma.. Ya lor all fried stuffs sure kids likes. A new milestone next year. No more enjoy enjoy when go into primary school. More homeworks and teachers are stricter. Small kucing going into Chinese school?? Yaloh. Should wear glasses then look like Harry Potter loh. Hehe. Wah in the graduation pics at the end, you look like such a big boy already!!! Well done SK!! Congratulations, you are a big boy now and will be going to regular grade school next. When will that be? How long? 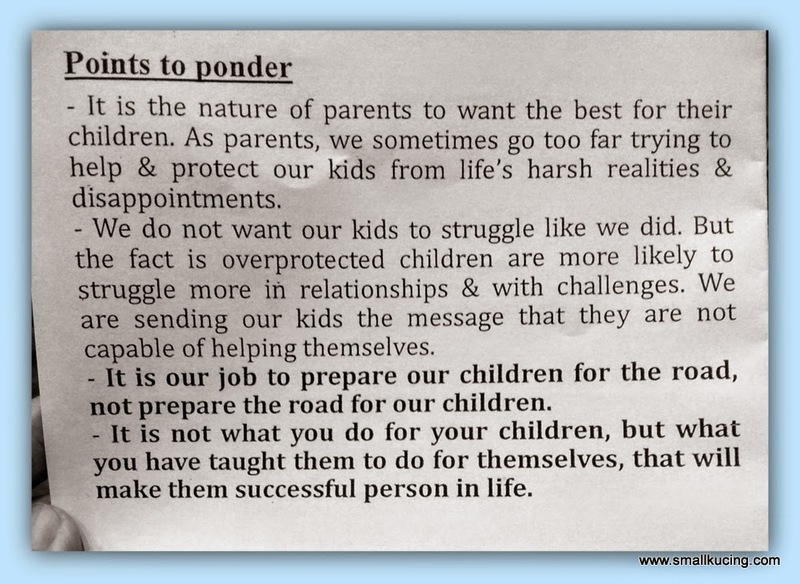 The points to ponder is so true, a parents job is to teach their children how to be ready for the world and survive and be strong. Yeah....a new milestone awaiting next year. Congrats! Big boy edy. 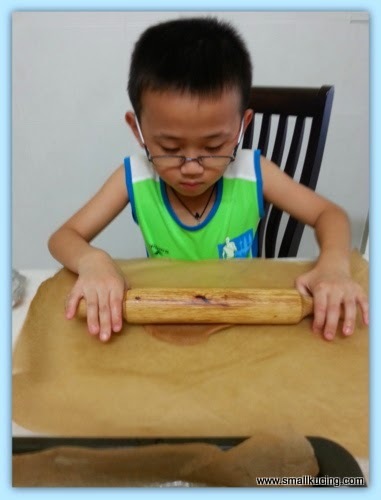 Sibuk wanna make cookies for gfs leh. Nowadays kindy graduation is a big event! Cookies look ok ler. At least got ceremony and gown and mortar board haha. Congrats to your little one esp on the achievement. Looks like from next year, it will be another story with starting school. Looking forward to him growing up. nah...they anxious to get "home"
Not Num1 la...but rather ...last time dumb dumb but now improve much liao lo. Haiseh, i wrote an earlier comment and then signed in, and now can't see it, wondering if it went through or not. Anyway, just wanted to say congratulations to you and wishing you the best in your new school, be good boy ya. Also, it's very funny reading your post with all the funny bright yellow birdie faces. Will you still remember your classmates and teachers faces after many years by looking at birdie faces? Congratz Small Kucing!! Good luck for entering the primary school. hehe. Congrats on the Kindergarten graduation... Lots of great photos --and lots of smiles!!!!! I know that you are proud of that big boy. He is growing up much too fast... Love the Points to Ponder... Great words. Happy Graduation!!! You are making me hungry for cookies!! Congrats to Small Kucing! Next year go to big boys' school. Guess you must be excited.